The PS-LX310 has a direct drive system with Sony's unique BSL (brushless and slotless) motor which has a high signal to noise ratio to virtually eliminate wow and flutter. The motors high torque assures a quick attainment of 33 1/3 rpm after only 2/3 of a revolution. The turntable maintains an accurate and drift free speed by reference to a frequency generated by a very stable quartz oscillator. Automatic return and eject functions are activated by merely pushing the buttons. The low mass tonearm and cartridge allows the stylus to track with greater accuracy. 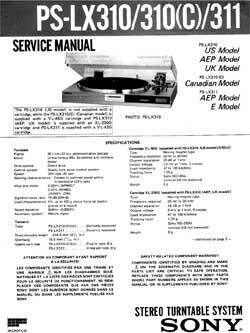 Sony PS-LX310 / PSLX310 owners manual, service manuals and schematics are for reference only and the Vinyl Engine bears no responsibility for errors or other inaccuracies. The PDF files are provided under strict licence. Reproduction without prior permission or for financial gain is strictly prohibited. This website is not affiliated with or sponsored by Sony.